The second edition of the AERC Membership Committee's blog, "Why Endurance?" features a remarkable story of a journey of a former ultra-marathon runner turned endurance rider. Gwen Hall shares her inspirational and beautiful story of endurance and a love of the horse. I was honored to be asked to write a short article on why I ride endurance, specifically, why I choose to sometimes race endurance and what got me started in the sport. I am not a writer by trade, and to put into words what at times is an intensely emotional experience for me is very difficult. For now, with this horse, my goals are sitius, altius, fortius- for as long as he enjoys doing it. The exhilaration of pushing our personal limits farther is incredible, and I believe that, at least for my four legged partner, the feeling seems to be mutual. If only I had a video of when he returned from his first 100 mile race! His chest was puffed out like a peacock and he strutted out to the pasture in front of his buddies like he was the greatest thing since sliced bread. Whoever says pride is only a human emotion does not know horses! My introduction to endurance sports started with running ultramarathons competitively. Actually, it started with running to lose weight which led to ultramarathons. I have completed races up to 100 miles, can’t remember how many marathons, and at one time proudly held three separate women’s ultra-distance course records. I learned from ultras that we are capable of so much more than we think we are. Some of my fondest memories though were not of the wins or completions of tough races, but the camaraderie amongst the runners. The front runners would cheer on the slower runners as they passed on an out and back section, or even came back after their finish (and a shower/nap in some cases) to welcome the back of the pack at the finish line. Many of the top runners showed true sportsmanship and for some of us mere mortals we could only aspire to compete as they did. I also learned the hard way that the long term wear and tear of training can catch up with you and what can happen when you do not listen to your body. Unfortunately, various life challenges cropped up that put an end on my time and ability to run/train as I once did. But as they say, when one door closes in your life, another opens. 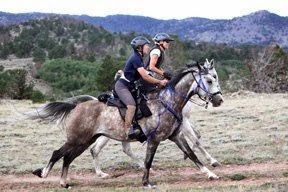 Mine opened to the fantastic sport of endurance riding. I really wanted to call this post “Planes, Trains, and Automobiles,” but there were no planes and very few automobiles involved in this weekend’s workouts! Especially when compared to the amount of bucking involved. Legs started the weekend with a 9 mile ride with Zephyr and Bannarr. Zephyr was a spooking fool, so Lori stayed back while Bannarr, Legs and I took a young rider another mile – at a lope. Hence Zephyr’s lower mileage with the same time on his conditioning log (if any of you are comparing). Australian Endurance rider talks about starting out in Endurance and learning how to manage her horse to complete to win. After volunteering at the Tom Quilty I was so pumped to ride again... luckily Lake Manchester was right around the corner! My darling Mr.T had been home for a few weeks now and doing really well with some long training rides under his shoes. I planned to do his first endurance ride as a relatively easy 20km around "The Lake" on the Saturday.